Using lager in the batter for our national fish dish makes the crisp coating fabulously light – and any that’s left over provides the perfect accompaniment. Mix the flour and salt together in a large bowl. Slowly pour in the beer, whisking all the time, until the mixture is smooth and has a consistency similar to double cream. Heat the oil in a deep-fat fryer or large saucepan to about 190°C – the point at which a 2cm cube of bread browns in 25 seconds. 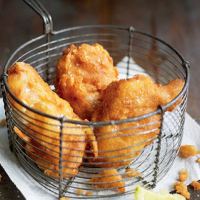 Dip the cod fillets in the batter to coat, then fry, in three batches, for 4–5 minutes each, until the batter is crisp and golden and the fish is cooked through; the exact cooking time will depend on the thickness of the fish. Drain on kitchen paper and keep warm while you cook the rest. Serve with the lemon wedges. It may seem unoriginal, but a glass or two of the same beer you have used in the recipe will harmonise perfectly. The sweet, spicy hoppiness of this beer gives a little exotic vim to the deliciously plain fare.